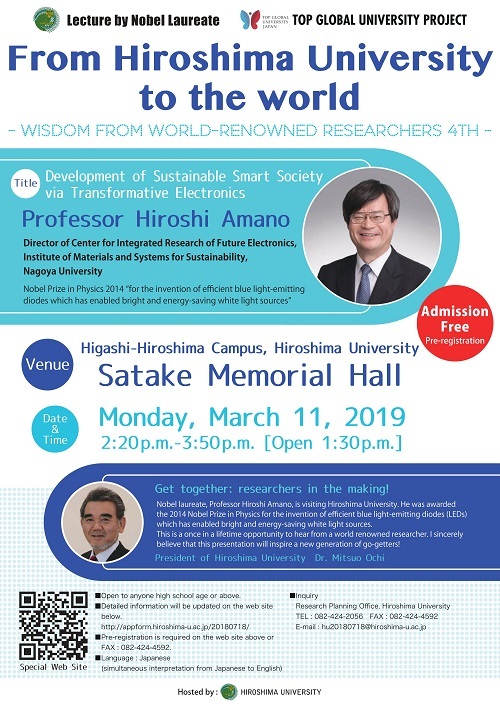 We are pleased to welcome Professor Hiroshi Amano (Nobel Laureate in Physics) to give a lecture as follows. He was awarded the 2014 Nobel Prize in Physics for the invention of efficient blue light-emitting diodes which has enabled bright and energy-saving white light sources. Admission is free, and simultaneous interpretation from Japanese to English is available. The lecture is open to anyone high school age or above. We sincerely believe that this event will inspire a new generation of go-getters!